Since 1986, we have sold High-Quality EQUALIZER Scales to thousands of fishing organizations around the globe. When it comes to fishing tournament Weigh-Ins, Equalizer scales set the standards. Our scales are built to exacting specifications, using only the finest components, which makes them dependable, long-lasting and accurate. We offer many different tournament Weigh-In models, weighing in pounds and ounces or pounds and hundredths and in a price range to fit any budget. We also offer a full line of accessories to help you get the most out of your EQUALIZER® Scale. To see our complete line of scales, click the button below. Thank you all for your years of continued business and your patience with us while we have been transitioning. 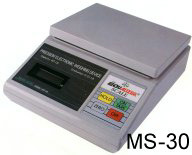 We are offering you special pricing on our most loved models the MS-30 and MS-40, with accessories !! This is for a limited time only and while supplies last!! The total cost of the package deal with shipping is less expensive then getting just the scale alone with shipping. This is a great deal even if you already have a scale, it is great to have a back up scale, plus this is brand new. Our hard shell cases are great because they are sturdy and they hold everything in it; your scale, adapters, extra batteries. And it keeps it out of the elements. These are unheard of prices, so get them while you can!! THESE PRICES ARE VALID FOR A LIMITED TIME. YOU MUST BUY PACKAGE DEAL TO GET THE 20% DISCOUNT. Please place your order via email. Include your name, shipping address, phone number and what you would like to purchase. We will get back to you within 24hrs.